Look out taste buds, here comes chocolate! Easy, 4 ingredient chunky chocolate bark that is vegan and gluten-free. Made with pecans, goji berries, and almonds, this protein-packed treat is sure to tame any chocolate craving. Goji berries are also an amazing source of vitamin A and iron. Line baking sheet or large plate with parchment paper (or a silicone baking mat) and pour melted chocolate over paper. 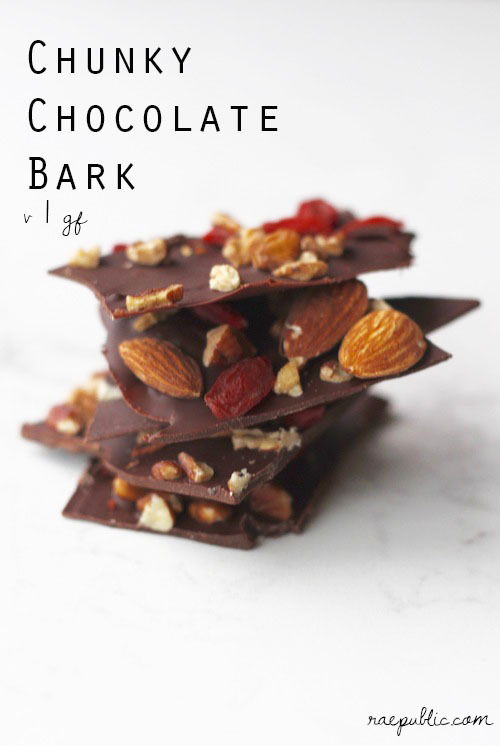 Spread chocolate out to desired thickness and sprinkle pecans, goji berries and almonds over chocolate. Gently press dry ingredients into chocolate and place tray in freezer. If you like this vegan chocolate you also might enjoy this plant-based PB + Banana Shake. Make sure to follow me on your favorite social media platforms and comment below if you're lovin' this vegan dessert recipe!